They returned an Inuit baby to his parents and traded the deep freeze for a big thaw. Then they explored a dangerous subterranean world where each new dinosaur was bigger than the last. Now the Paleolithic protagonists from ICE AGE are back for a third sequel. That’s four, count ‘em—four—Flintstonian flicks since 20th Century Fox’s Blue Sky Studies introduced their prehistoric zoo crew a decade ago. 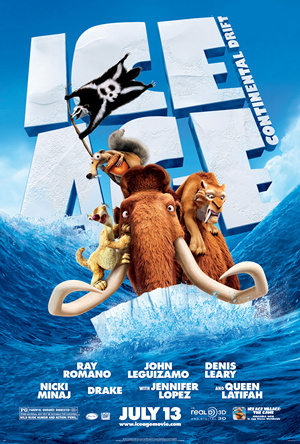 ICE AGE: CONTINENTAL DRIFT doesn’t improve upon the storytelling of its predecessors, nor does it expound much upon the now-familiar characters. But it is an eye-popping, computer-animated feel-gooder that once again celebrates the merits of staying true friends, family, and oneself. Remember Peaches, the infant wooly mammoth born to Manny (Ray Romano) and Ellie (Queen Latifah) at the end of the last installment—DAWN OF THE DINOSAURS? No? Well, Peaches (Keke Palmer) is a teenager now, and she’s doing what teens do best: alienating her parents and testing her autonomy. She also nudges aside mole-hog buddy Louis (Josh Gad) to pursue a crush on bad-boy pachyderm Ethan (Drake). But Peaches comes to appreciate the security and counsel afforded by her overbearing father when Manny gets stranded on an oceangoing glacier with grizzled saber-tooth tiger Diego (Denis Leary) and hopelessly lisping sloth Sid (John Leguizamo). The tectonic plates beneath supercontinent Pangaea have shifted, thanks in part to the ongoing mischief of acorn-obsessed Scrat (Chris Wedge). As their world crumbles around them, Peaches, Ellie, and a gaggle of other animals—including possum twins Crash and Eddie—must migrate to the safety of a land bridge and wait for Manny’s safe return. Sid gets to bond with his Granny (Wanda Sykes) after his parents dump the aged sloth at his doorstep. The only thing Sid and Granny have in common is that they’re both outcasts, but it’s a starting point. 80-year old Granny must gum her food (or have someone else chew it for her) and during their ocean exile has conversations with an invisible friend, “Precious,” who may or may not be real. But Gran might just teach Sid a thing or two about taking pride in one’s eccentricity instead of feeling ashamed because of it. The gang navigates a hurricane only to be captured by prickly primate pirate Captain Gutt (Peter Dinklage), whose simian haircut resembles a tri-corne hat and whose sword is crafted from a sawfish skeleton. Gutt is capitalizing on the continental calamity by naming himself king of the high seas, and he’s got an entourage of fur-and-flipper-bearing goons as his honor guard—including a dopey elephant seal (Nick Frost) and pugnacious rabbit (Aziz Ansari). Gutt goes bananas for revenge when Manny, Diego, and Sid capsize his ice-ship during an ill-begotten getaway. But his first mate—sleek lady saber-tooth Shira (Jennifer Lopez)—has mutiny on the mind, especially after Diego shows her there’s more to life than pillaging and plundering at the behest of some salty aquatic ape. The castaway critters must overpower Gutt and swipe his new ship in order to return home; the current generated by a “switch-back” island just might propel them back to the mainland. They get help from a pack of pint-sized, Bambi-eyed hyraxs—who up the film’s quotient of Ewok cutesiness—but must avoid a school of snaggle-toothed sirens to make good their escape. Meanwhile, Scrat follows a map on his quest for the Valhalla of acorns. Patrick Stewart (of STAR TREK and X-MEN fame) has an amusing cameo at the end of Scrat’s journey, the topographic repercussions of which come to bear directly on the Earth we know today. Directors Steve Martino and Mike Thurmier make the most of a loose screenplay by Jason Fuchs and Michael Berg, imparting crucial lessons about being loyal to friends and not compromising one’s ethics to appease others. The latest ICE AGE packs all the requisite potty-jokes and physical slapstick we’ve come to expect from this bunch, which makes the 80-minute runtime more tolerable. The cast is competent, especially GAME OF THRONES’ Dinklage (who played an irritable author in ELF and a bristly Simon Barsinister in UNDERDOG) as vicious Captain Gutt. But evolution demands more from the story department if this series is to continue. 2 out of 4 stars. CONTINENTAL DRIFT is preceded by delightful animated short THE LONGEST DAYCARE, wherein THE SIMPSONS’ pacifier-pooching daughter Maggie rescues a caterpillar from a sadistic baby lepidopterist (er, butterfly collector).